Please ignore the bad photos because they do not convey the deliciousness contained within! Bowl eating is my kind of food. A bunch of stuff, usually a mix of vegetables and grains, get mixed into a bowl and covered in a tasty dressing. It’s not fancy, but it’s pretty much how we eat most often around here. I love this bowl dinner because it contains a mix of both roasted and raw vegetables and would be easy to add your own spin based on what you had available. It’s like an elevated salad that totally works for dinner. If you wanted to throw in leftover chicken, tofu or salmon, go right ahead! 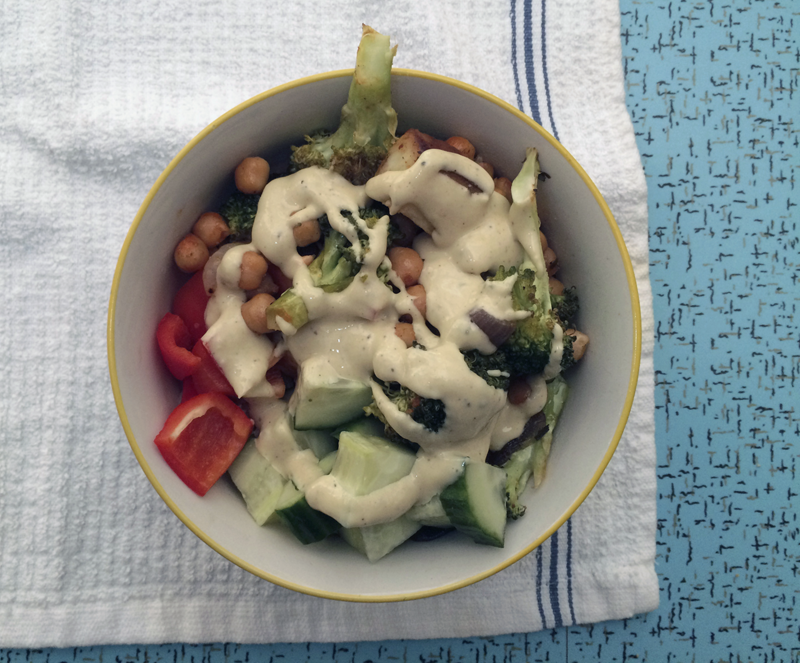 The dressing is a lemony tasting tahini version with the addition of nutritional yeast. It makes plenty that you’ll have enough leftovers, which is a good thing, as it’s delicious on a green salad too. Cook the grain of your choice, if using. Add diced sweet potato and onion onto a silpat-covered baking tray. Drizzle with olive oil and sprinkle with aleppo pepper. Bake for 15 minutes. Remove from oven, toss and add in broccoli and chickpeas. Sprinkle with a little more olive oil, if needed, and some kosher salt and cumin. Bake for another 15-20 minutes or until sweet potato is tender. 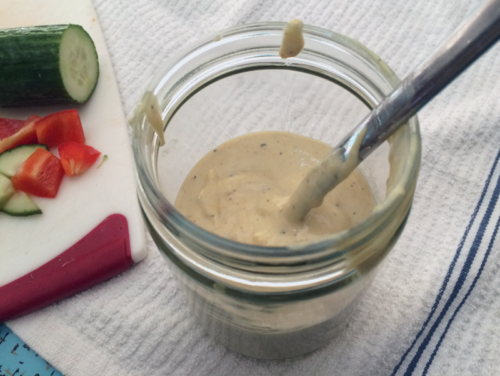 Meanwhile, combine the dressing ingredients into a food processor until combined and smooth. Add additional water if needed. 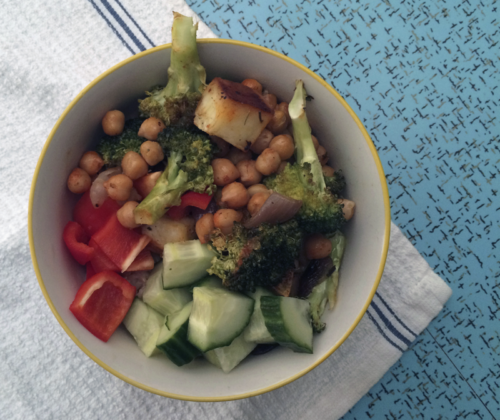 In a bowl, add in your cooked grains and top with the vegetable chickpea mixture along with some cucumber and red pepper. Drizzle with tahini lemon sauce and serve with hot sauce, if needed. Serves 4, with additional sauce to be used throughout the week on your favourite salads. Adding the veggies in over time was a good idea, it ensured that everything came out similarly tender/crisp. Cumin and Aleppo pepper are a good combination. I stupidly used active yeast instead of nutritional yeast. As I unpacked my clothes from a recent trip, the dressing in the sealed bottle “rose” and then exploded all over the kitchen, drooled over the counter, and covered a new sweater with foamy tahini-laced white stuff. Then I asked the Internet to explain the difference between active yeast and nutritional yeast. Got it. Cold cuke over hot veggies didn’t appeal so I roasted the red pepper, dumped the bubbling nightmare dressing down the drain, and called it a day. Actually, the meal was find without any dressing, just a tasty kickpleat curated veggie roast! Oh no, Robert! Definitely the wrong kind of yeast 🙂 Glad the meal was fine without the dressing!